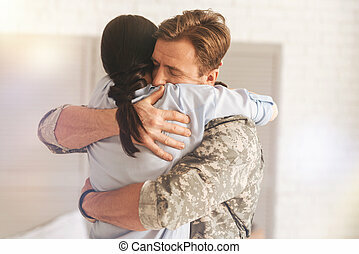 Military man and his family standing in embrace isolated on white background. The family spends time together. 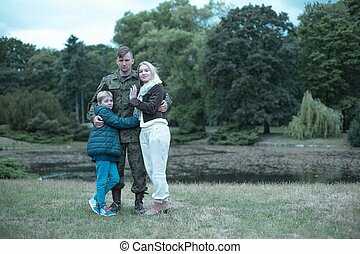 A father in military uniform rests with his son and wife. They are looking at something on the tablet. The family spends time together. 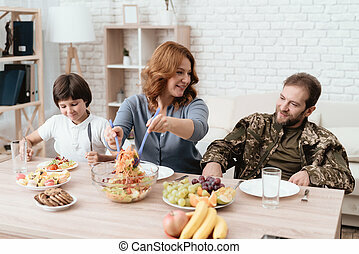 A disabled father in military uniform is eating fruits with his family. They are watching a tv. The family spends time together. 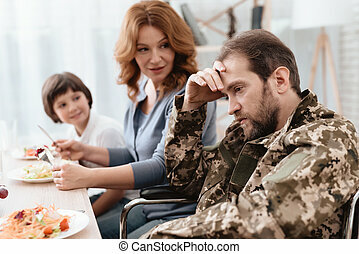 A disabled father in military uniform rests with his son and wife. 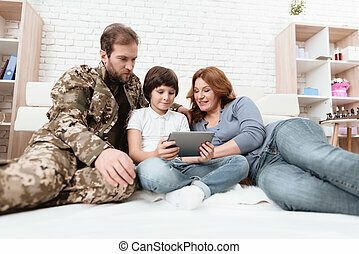 They are looking at something on the tablet. 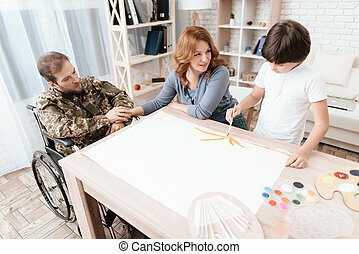 A veteran in military uniform in a wheelchair spends time with his family. The family draws together. 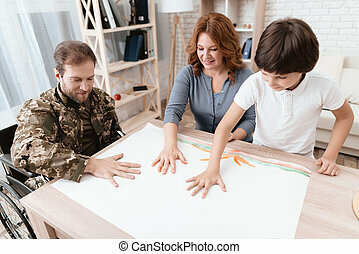 The family draws with palms. 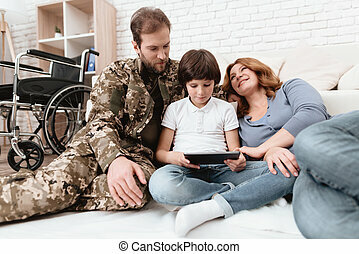 A veteran in military uniform in a wheelchair spends time with his family. The family draws together. The family draws palms. 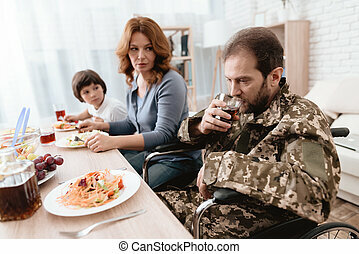 A veteran in a wheelchair dines with his family. 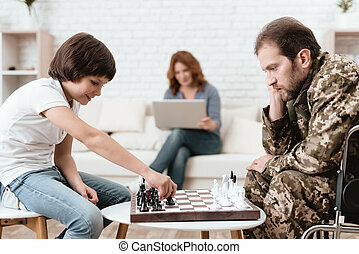 A man in military uniform is sitting at the kitchen table. The veteran is depressed. He has problems with alcohol. Veteran in military uniform in a wheelchair. 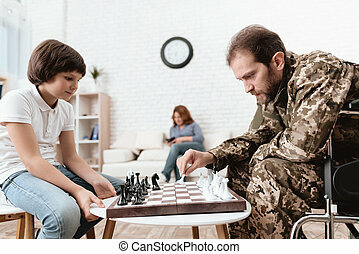 A disabled man plays with his son in chess. His wife sits behind him on the couch with a laptop. 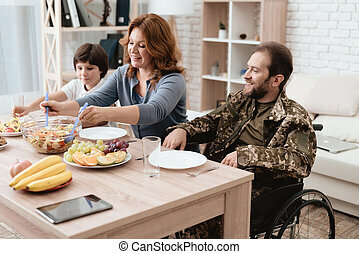 A veteran in a wheelchair dines with his family. A man in uniform is sitting at the kitchen table. The family spends time together. 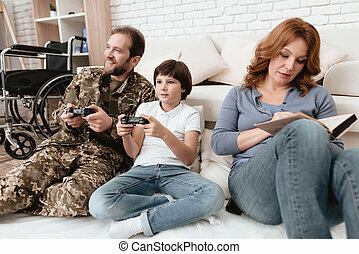 A disabled father in military uniform is playing with his son on console. Mother is reading a book near them. 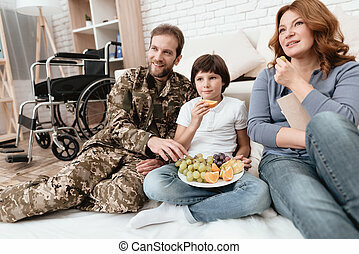 A veteran in military uniform in a wheelchair spends time with his family. 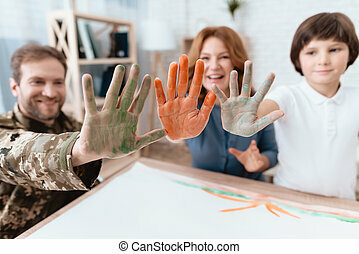 The boy draws with a brush and his parents look at his work.